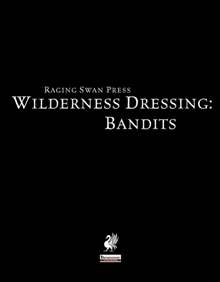 This installment of the Wilderness Dressing-series is 13 pages long, 1 page front cover, 1 page advertisement, 2 pages of editorial, 1 page ToC/foreword, 1 page stock art, 1 page SRD, 1 page back cover, leaving us with 5 pages of content, so let’s take a look! Unlike most dressing-pdfs, this one is rather statblock heavy, offering us 8 statblocks ranging from CR 1/2 to CR 4 and kicks off with a page of rank and file bandits, including a d10-table of names and short backgrounds for the bandits. Beyond that, we also get d4 half-elf backgrounds for the CR 1 statblock provided for them, while Half-orc bandits get 5 backgrounds. We also get 4 sample statblocks for bandit leaders ranging from CR 4 to CR 1, featuring rangers, fighter/rogues, cleric/fighters and a rogue/enchanter as well as 8 sample backgrounds as well as 6 sample bandit groups from EL 3 to 6 and d12 hooks and complications that include having the bandits starving, having bandits having been ambushed themselves etc. – all well-written, as we’ve come to expect from RSP’s mastermind Creighton Broadhurst. Editing and formatting are top-notch, I didn’t notice any glitches. Layout adhere to RSP’s elegant 2-column b/w-standard and the pdf comes fully bookmarked and in two versions, one optimized for screen-use and one for the printer. Both come fully bookmarked for your convenience. Creighton Broadhurst knows how to create neat backgrounds and the statblocks are nice as well – low level and not a challenge for experienced players or particularly interesting builds, but ones that fit well within the context of the role of bandit lords and easily integrated into a given setting. And yet, the pdf, while useful, feels like it could have used another format – one pdf stats and one fluff or a bigger book – like one that actually also features ambush tactics, traps, concealment etc. There is nothing wrong with this pdf, but it’s a) short and useful, but not as useful as a collection of encounters (spanning more levels) supplied with fluff tables would have been. Thus, I’ll remain with a final verdict of 3.5 stars, rounded down for the purpose of this platform – unless you need bandits for the lowest levels. As written, this pdf offers nice content, but perhaps could have used another format to truly shine. You can get these bandit-stats here on OBS and here on d20pfsrd.com’s store!